Margaret Leigh, better known as Molly Leigh was born in Burslem, Stoke-on-Trent, a town of pottery, around the time 1685. She was born into a wealthy family, yeoman, a wealthy type of farmers; the possible reason she was never exiled. One of the known facts was that Molly was extremely ugly as well as that she had an eye defect which could have been the possible reason she was shunned in her village and accused to be a witch. Molly lived with her mother and her step-father as growing up. She had a good relationship with her mother but the same could not be said about her step-father, she excluded him from any part of her will and did not want him associated with her; the reason for their difficult relationship is unknown. Following on from family tradition, Molly owned a dairy farm in Hamil grange, away from the town; she was many times accused of watering down the milk, which did not put her on friendly bases with the locals. 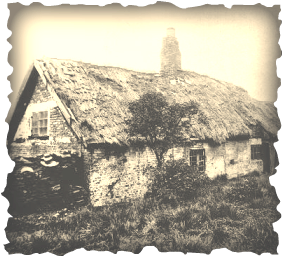 Her cottage was also present on her farm, famous for the dark and dingy look and also for the hawthorn bush that never blossomed. She lived alone as she never married, quite unusual for a woman living at the time, except for her blackbird which was known to follow Molly everywhere. Molly died of natural causes in the year 1746; she was quite wealthy at the time of her death. In her will, she not only remembered her close family but the poor people of her home town of Burslem. Her mother received her rent and profits of her land at Jackfeilds. But her step-father Joseph Booth was excluded from any part of her will. Profits from Molly's land went to buy 6 pence loaves for the poor as well as that in her will she requested a hospital to be built for women. Quite charitable acts for a devil's associate.